The Olivia Collection entryway bench by Jennifer Taylor Home. 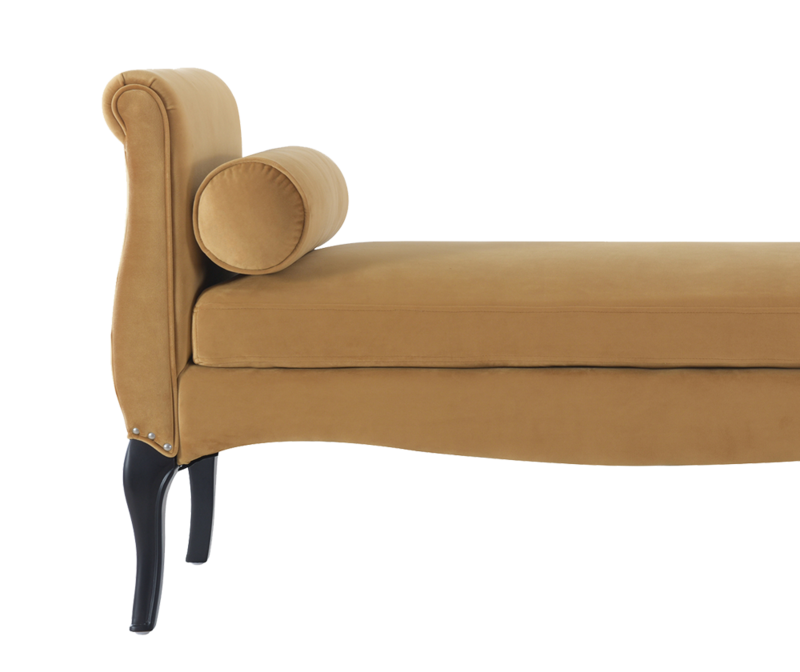 Beautifully handmade with elegant rolled arms, 2 bolster pillows, and French cabriole style hand stained solid wood legs adorned at the top with nailhead accents. You must study this piece to appreciate all the lines and curves that makes it a true work or art. The immaculate design of the Olivia entryway bench brings the look of sophistication, class, and lounging comfort to any room in the home. The selected fabric features a polyester blend and is engineered for long life. The solid wood frame is made from kiln-dried birch which provides exceptional support and stability. Jennifer Taylor Home offers a unique versatility in design and makes use of a variety of trend inspired color palettes and textures. Our products bring new life to the classic American home. The Olivia is an eye catching bench with gorgeous curves. 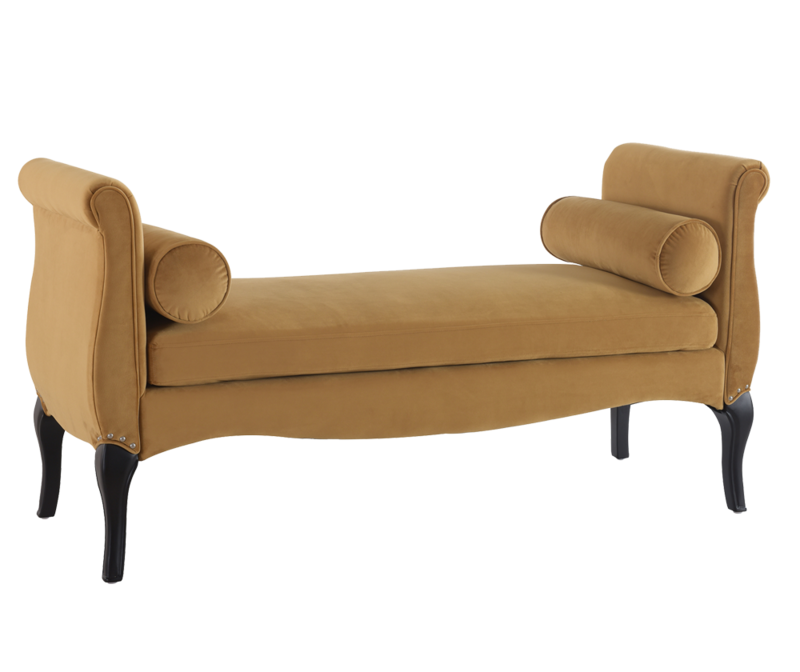 Beautifully handmade with elegant rolled arms, 2 bolster pillows, and French cabriole style hand stained solid wood legs adorned at the top with nailhead accents. This bench is the perfect addition to your home décor. The immaculate design of the Olivia entryway bench brings the look of sophistication, class, and lounging comfort to any room in the home. Made from Premium woven polyester wrapped around high-density flame-retardant foam padding and cushions for a medium firm feel, this bench is engineered to last a life time. Comes in a variety of six stunning colors. Love this bench! Thank you Delilah for showing this item to me. The arctic blue bench is gorgeous with great quality. This is a true color from the bench photos, rather than the online color square. I loved the style of this piece, it looks so sophisticated and personifies luxury. I put the piece at the foot of my bed and it reminds me of being in an expensive hotel room. The only reason my rating is only 4 stars rather than 5 is because, one the color is darker; this is a dark mauve not dusty rose pink. Also despite it's fine structure and outer materials, it seems like there is paper used inside the cushion as stuffing in addition to foam. You can hear crackling when you sit that makes me imagine that brown shipping paper that people wrap their shipping boxes in. Fortunately this is more just for show, being positioned at the foot of my bed, so guests won't have the opportunity to sit on it and here the crumple crackle sounds, I anticipate receiving many compliments on this piece and for the price I would recommend this piece for the price.